Extremely funny as it is extremely wrong, the movie features extreme violence and wrong humour that I've not seen in a mainstream movie since Donnie Darko. 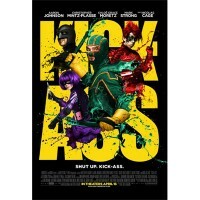 The movie comments on how come we find inspiration from super heroes but fail to help each-other. What happens if you decide to become one. Well, think that and then hold the idea of Napoleon Dynamite stepping up for the job. Well I went to see this film as a second choice as Clash Of the Titans my boyfriend wanted to see was sold out. I have to say it was the better choice, although shockingly graphic in some of the violent scenes, it was packed with very funny moments. Stupid at times but keeps you engaged if your light hearted and like the new style of comedy coming from the new bread of American film comedy kids.